Topics: Stephen Kellogg & The Sixers, Dawes, Sarah Jarosz, The Ark, and Listen. Age: The domain is 21 years and 9 months old. 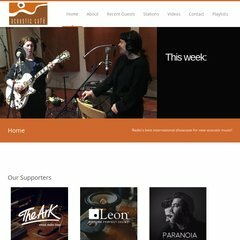 acafe.com Acoustic Café :: Radio&apos;s best international showcase for new ..
On average 3.00 pages are viewed each, by the estimated 140 daily visitors. It is hosted by Tech Valley Communications (New York, Albany,) using Apache web server. It has 2 DNS records, auth-ns1.tvc-ip.com, and auth-ns2.tvc-ip.com. Acafe.com's server IP number is 72.0.157.4. PING www. (72.0.157.4) 56(84) bytes of data.